I know this is happening too often, but posting frequency will remain low in the near future due to - what else? - work. In the meanwhile, I will point you towards Ajay Shah's exhaustive compilation of links related to the Government's High Powered Expert Committee (HPEC) Report on "Mumbai as an International Finance Centre (IFC)". For now, my interest is limited to the committee's comments on Mumbai's physical and social infrastructure and governance (slides 24 to 26 of the HPEC presentation). Slide 12 titled "Mumbai's physical infrastructure" includes this point "To be an IFC: Mumbai needs to be 1st world city". Slide 26 (on Governance) includes "City's Governance must be independent of state" and "City's management needs to be autonomous, transparent and accountable to City residents"
Some thoughts on this photo I took at the Mahim Church junction in Mumbai. Comments, as always, most welcome. (Note - Before posting, I've digitally smudged the last four digits of the number plate). 2. Is driving a car with an improper number plate a fine? Yes, under Section 177 of the Motor Vehicles Act (MVA) and Section 236 of the Maharashtra Motor Vehicles Rules 1989. 5. Where did I get this information? Here, the Mumbai Traffic Police's website. (Nice site. I continue to be surprised by how informative and exhaustive some Govt. websites have become..and hope to post on it in the future). 6. What's the fine for a similar offence in New York? I don't know. I tried looking it up here but I couldn't find an answer. Does anyone out there know? would love some help. Thanks. 7. 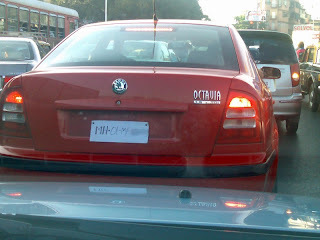 Coming back to Mahim, what was the owner/driver thinking? I don't know but I'm guessing he didn't know the fine is Rs100. Perhaps he didn't even think its an offence. Maybe he assumed he could bribe his way out. Or, maybe he was just taking his car to have a proper number-plate fitted. I'll never know. 8. Why this post? There'd be enough people who'd go "big deal". While I don't want to gripe about the legendary Mumbai indifference/chalta hai attitude, etc., I thought its a good time to post this because there's talk of how Mumbai should be get tougher on implementing its traffic penalties, taking an example from Delhi. Two articles worth highlighting from today's newspapers..
Nariman Point, the high-profile business address of the nation, will house 100 more MLAs of the state legislature. The proposed swanky MLA hostels, coming up on a government plot close to Nariman Point fire station, will be the fifth such hostel for Assembly members. According to sources, the expected cost of building the hostels is Rs 20 crore and it will be part of Rs 375-crore Mantralaya makeover project. The decision to build the new hostels was taken by a committee comprising Speaker of the Assembly, the chairman of the Legislative Council and the chief minister. And then, this other article which takes us north of Nariman Point to Lower Parel, where Mumbai's Mills were once located. The article tells us that even though the Maharashtra State Government could not provide houses - as required by law - to the displaced mill workers (after the mills were shut down for redevelopment), they are trying their best to provide jobs for them. Chief Minister Vilasrao Deshmukh categorically told the House that although it was not possible to ensure that each and every worker got a house for himself, the government will try to provide shelter to most. "The 2001 amendment in the DCR has a clear provision for a house for every mill worker. We have plans of 10,000 more houses on the land submitted to MHADA by the mill owners. The number of the houses may go up as few more mills undergoing redevelopment are expected to release some land for the workers. However, these houses will be come ‘at a cost’,” Deshmukh said. Ramesh Ramanathan, co-founder Janaagraha, is a man I continue to admire, for a variety of reasons, the main one being his faith and efforts in the area of participatory democracy. He has an interesting article titled "The courage to demand" (link here, registration required) in today’s Mint. His piece is based on Transport For London’s ad, looking for a Managing Director (Planning). The Managing Director (MD), Planning will play a central role in defining the future development of transport policy and the transport network. This is a new role reporting directly to the Transport Commissioner. Developing and sustaining relationships with Government departments and other stakeholders to ensure engagement and buy-in to TfL's vision, strategies and plans. And then, this bit on who can apply – this is really something. We want to be as diverse as the city we represent and welcome applications from everyone, regardless of age, gender, ethnicity, sexual orientation, faith or disability. Applications are especially welcomed from women, people from black, asian and minority ethnic groups and disabled people, since they are currently under-represented at this level. Ironic? Of course. True? Sadly yes. I’m particularly stumped by that “In the four years since its inception..” part. Lets do the obvious extrapolation to the Mumbai Metro. Depending on what you mean when you say inception, the Mumbai Metro is a whopping 40 years old, because it was first conceived in 1967-68 (more detailed time-line in my earlier post here). Or if you take the relevant date for “inception” as the date of the contract being awarded for one leg (i.e. the Versova-Andheri-Ghatkopar leg, or VAG), then we’ll turn one on May 18, 2007. Or if you consider the day the VAG leg was flagged off, then we’re, oh lets see, only nine months old. Which is a baby compared to a four-year old project. Probably, Mumbai Metro1, i.e., Reliance Energy and MMRDA (the partners for VAG), breathe easy knowing that Bangalore Metro hasn’t achieved much in four years since inception. And that's bad news for Mumbaikars. I agree with Mr. Ramanathan when he says “We don’t give the best people a shot at running our public institutions. We must not settle for mediocrity”. Out here in Bombay, we're doing fine with indifference, leave alone mediocrity, thank you very much. Metro or no Metro, life goes on. Whither Mumbai Metro or wither Mumbai Metro? Time will tell. 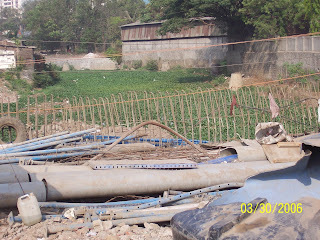 Kiran has been kind enough to share these photos of the development work going on around the Mithi River. These are all in and around the Saki Naka area, Andheri East. 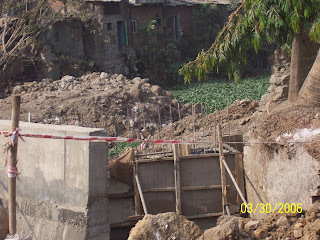 The first two photos (right-hand and left-hand view from the road) are of the construction work (is that a raft there? 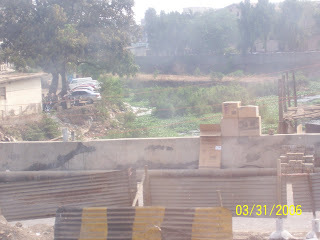 ), probably road-widening work, near the River (notice the green leaves, I'm guessing the river flows below it). Another photo of the road extension, which can be seen a bit more clearer now. This is taken from the other side of the same Andheri Kurla Road (between Ghatkopar and Andheri). Notice the green growth there as well. Finally in this photo below, you can see a bit of the river. As Kiran (via e-mail) points out, "its almost a bottleneck formed due to a land formation coming in from the left side". This reminds me of urban planner Chandrashekhar Prabhu's reply to our question (as part of the Haftamag interview with him), on the Mithi River development work post 26/7. 1. It's almost a year after the 26/7 floods in Mumbai. 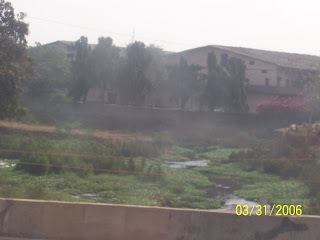 How has the state progressed on cleaning up the Mithi River? Other than paltry beautification scheme of cleaning up the Mithi River, we have not moved much. The Mithi is as dirty as it used to be and the State has lost Rs. 600crores. The Government's efforts are all cosmetic dabs at addressing the problem. We need to understand the concept of a river delta. A delta is where the river splits into tributaries and covers huge tracts of land in these tributaries. The land between these tributaries acts as a sponge and in technical terms, these lands are dissipation spaces. Any low-lying river would have these dissipation spaces as bases, which hold the water during high tide and heavy rains. The basic law in any urban development procedure is that these dissipation spaces should not be tampered with. When ever there is a water body coming down from the hills, especially in undulated land, and meeting the sea, vacant space has to be given to the water body. In our case, the entire Bandra Kurla Complex (BKC) has been planned exactly in this dissipation space. What has happened is that 300-400 acres of land which was part of the dissipation space was taken over and filled up by the stroke of a pen. No amount of dredging would compensate for that. Conversation with a young man in a vest, paan stains on it and his lips. Starts with casual platitudes, but then gets tense. "Look, the days of that chutiya Gandhi are gone, OK?" he says suddenly. "I won't offer my cheek to be hit any more", and here he sticks his right cheek towards me nearly as crudely as if he had grabbed his crotch. "They trouble us so much on the border," he says. "Then Godhra happened. We had to hit back."